Last night we had a bottle of riesling with dinner and this easy recipe was the perfect match. With it's delightful subtle lemon flavour it was a very refreshing meal. I used ready-rolled pastry but it would be even more delicious with home-made pastry. 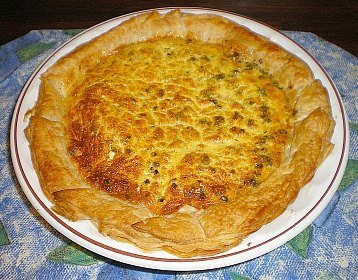 Also, the recipe below is for mini-quiches; I made just one large quiche and cooked it at 170 degrees celcius (fan-forced oven) for 35 minutes. I recommend our 2007 Eden Valley Riesling with this dish. Makes about 24 mini-quiches or one large quiche. Cut circles from pastry using a 6cm cutter, press into shallow patty pans or muffin trays. Divide smoked salmon between pastry cases. Combine creams, eggs, lemon rind, nutmeg, dill, chives, lemon pepper and black pepper, spoon over salmon (pastry cases should only be 2/3 full). Bake in a moderately hot oven (190 degrees celcius or 170 degrees celcius fan-forced) for 10 minutes or until puffed and golden brown.